I've heard of World book day (WBD) and often scrabbled around trying to create an outfit for Bubba in time for preschool or nursery based around her favourite book (loosely I might add). But I didn't really get what it was all about, didn't think about it or realise its importance. Now obviously running a book business and having a nearly 5 year old I now really get it. One of the reasons I didn't know it was important was because I just thought every family had access to books and loved reading as much as we do. After attending events over the last year, I realise this isn't the case. Some families don't give reading much thought or importance, choosing to spend money on other pursuits. That's great for them and I totally get it but this is where WBD is important because it encourages those non readers to pick up a book. WBD is a charity venture from UNESCO and it's now in its 19th year. All primary school age children receive a token (preschools and secondary schools need to apply for tokens). These tokens can be taken to a bookseller and the child can pick from a selection a book in exchange. 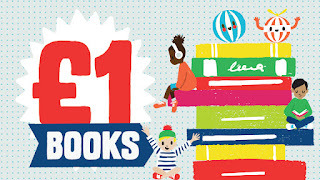 Or they can use their token towards any book (over £2.99) and get £1 off. 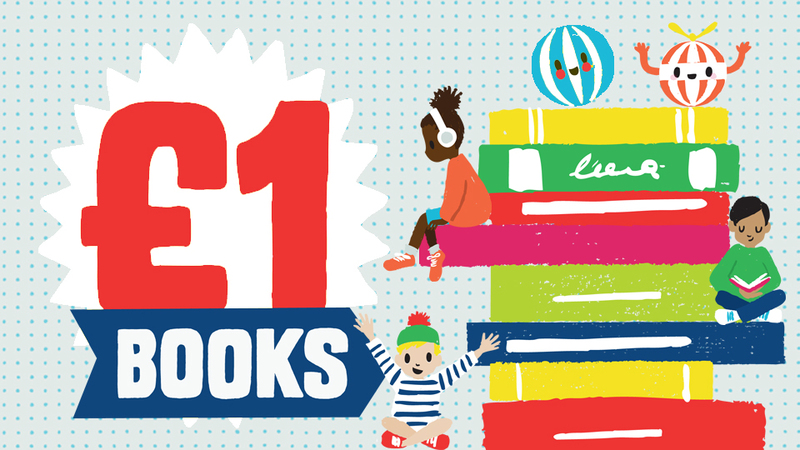 This celebration of reading is subsidised by publishers and book related charities to encourage children to develop a love of reading and to own a book of their own. The literacy trust have done lots of studies around the importance of encouragement at home to read together. Bubba doesn't have a favourite book, she hovers them all up in equal measure. We read a book every night at bedtime and just after starting school she went through a stage of not wanting a book at bedtime and I realised how much I enjoyed it and missed it. Thankfully she got over it pretty quickly and she's back to choosing a different story each night. Tokens can be redeemed between 29th February and 27th March 2016. I'd encourage everyone to use their tokens as books open up new worlds, give your imagination a run for its money and allows you as a parent to give your child a great start in life. Local booksellers are all involved and I'm no exception. Head over to www.Babblebooks.co.uk and contact me for more information. I stand at the sink, rushing through the washing up with a small boy pulling on my leg and crying out "cuggles, mumma, cuggles"
He tries to push me away from the sink and his cries become more urgent, his sister rushes in from the front room and announces she needs glue and scissors to make card for one of her friends at school. Its urgent...she needs them NOW! I sigh, heavily, flick off the soap suds from my washing up gloves (yes I am a mother, I wear rubber gloves). Peeling them off and throwing them on the side, I scoop up the small boy and his crying turns instantly to demands. My back hurts under the strain as he lunges towards the cupboard, little fingers jabbing the air wildly saying "Dat...mumma, dat". This alerts his partner in crime whose eyes dart towards the 'naughty cupboard' of all the chocolate and Haribo, she then joins in with the chorus of wants. All thoughts of glue are erased as they both easily forget that neither of them touched any dinner tonight. I become the bad guy when I say no and I know for the next hour they will tag team on trying to chip away at my resolve. Appeased slightly, they both sit quietly for five minutes watching the tv whilst I'm behind with my chin slightly in the air because a small head is wedged against it. It's then that I daydream of times forgotten, a different person, a life I used to live. 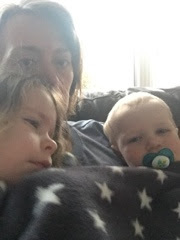 I love my babies and feel very blessed that they want to be with me all the time but sometimes I dream of the day I can go upstairs without a shout of "mummy, where have you gone mummy?" or worse...the sound of tiny feet padding after me. Daddy can leave the room and they barely look up and he gets to shower in peace and get ready without telling a small person to leave his things alone! It's time to get my boys pj's and milk but they both act like I'm trying to go away on a two week holiday rather than rushing upstairs to retrieve their things. I'm followed as far as the kitchen before I usher them both back in the front room, neither looks convinced so they sort of loiter in the hallway uncertain whether I can be trusted to go it alone. I act like I'm doing a supermarket trolley dash once upstairs, darting from room to room, barely enough time to even do a wee. I'm headed back down the stairs as I see them both aiming towards the stairs, after getting bored of licking the full length mirror by the door. I mentally tally up all the things that need a clean where I've seen sticky finger prints on glass, it's a never ending chore that will have to wait a while longer. Nappy changed and milk dispensed, my girl chooses this moment to suggest we play a game that requires me to charge around the room. I explain that her brother is having his milk, a task that now seems exclusively the preserve of mummy, even daddy isn't good enough for this. He sprawls across me as if he is kicking back in a rocking chair, totally in control, totally dominant. I watch the clock as bedtime nears, once daddy is home and the boy is dispatched I breath again but twice a week I am in total charge. So once my little man is safe in his bed, I can be found playing schools, sitting on the carpet whilst I also peel potatoes. My girl revels in the fact she now has me to herself and comes up with elaborate stories and games for us to play, cramming it into the slot between his bedtime and hers. Funnily enough she is less interested in sitting on me now until she starts getting tired and she curls up on me like a little cat, drowsy and calm. Before my babies I hadn't realised the day to day, hour by hour things I'd have to do to look after my babies to the best of my abilities. I constantly give up a piece of me in favour of them, I've become the manager in our household - not quite the boss but the one that is left in charge and depended on. I pre-empt moods and needs and as chef I am the one that sets the menus and implements them, as housekeeper I go about collecting up clothes and assessing whether they need cleaning, as security I sort out struggles and disagreements and as mummy I become their human security blanket, soothing and reassuring them when they need it. I just as easily blend into the background when I'm not needed and become part of the furniture, where I'm left wondering what happened in the hour before when their need for me was so great it prompted a full on hissy fit and a scuffle between the inmates! It makes me realise I'm stronger than I think, weaker than I'd like to be and living a sort of ground-hog day that one day I will miss. They take the best of me and I see those sacrifices helping them to evolve into great little people...if only we can work on their mummy dependency! Bubba got invited to a fairy themed birthday party and due to my lack of organisation we missed the party but we still got given a party bag at the school gates which was just lovely. Anyway in this bag was fairy themed bits and pieces which I thought was a nice touch, we received a small wand, some fairy inspired tattoo's and a kit to make our own fairy wand at home. This last bit was simply genius as it allowed me to put Cub to bed alone (something we've been struggling with lately) whilst bubba concentrated on decorating her wand. We are now in the midst of our own party planning and as my girl has no favourite tv programme or character or theme, it's all proving to be a bit troublesome. She's flip flopped between a fairy party, a caterpillar party (whatever that involves) and a pamper party. It doesn't help that I've gone ahead and booked a soft play venue - as previously that's what she wanted to do. This is her first party as host which doesn't help because it means she has lots of ideas and can't quite decide. I'm full of excitement and a bit nervous because it'll be my first in charge party. There's lots to remember and plan and some bits need forward planning. Cakes are one of those things and if you want an amazing cake you need to book it in as early as possible. 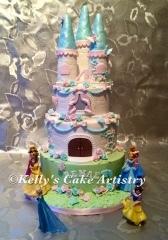 This is an amazing cake - courtesy of Kellys Cake Artistry is wonderful for a fairy tale theme. Now I just need to convince my girl that she needs to be decisive and pick a theme.